Physical Description:  p., col. ill., 22 x 28 cm. The most famous duel in American history between Aaron Burr and Alexander Hamilton is depicted. Booklist - 06/01/2015 It can be fairly challenging to effectively communicate the historical perspectives and evolving politics of the American Revolution to elementary-schoolers. It can be even more difficult to convey the nuances and personalities of major players. 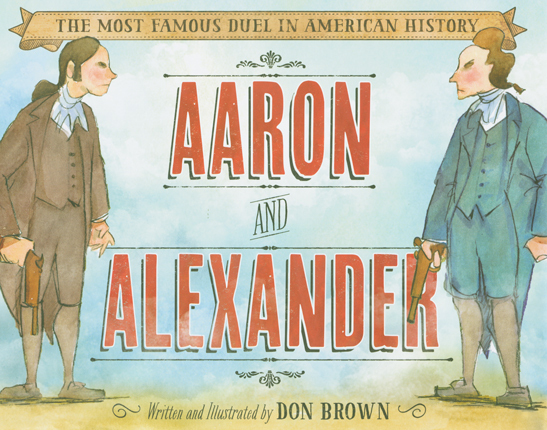 This picture-book dual biography does a thorough job of tracing the lives of Aaron Burr and Alexander Hamilton and accentuating the many parallel aspects of their upbringings. Both were orphans, exceptional students, soldiers in the Revolutionary War, lawyers (who actually worked together on a successful case), and high-profile politicians. It was politics that drove them apart and led to the notorious duel that resulted in Hamilton’s death. Brown wisely chooses to emphasize personal details that will interest young readers, accompanied by just enough background information and brief, judiciously chosen quotes. Detailed pencil and watercolor illustrations provide many opportunities to compare and contrast, often through two-page facing spreads. Pair this with Dennis Brindell Fradin’s Duel! (2008) to introduce students to these two patriots and spark interest in more in-depth research. - Copyright 2015 Booklist. School Library Journal - 07/01/2015 Gr 3–5—Brown has taken on a formidable task in trying to present this controversial incident in American history to a picture book audience. Brown begins by describing the childhoods of Aaron Burr and Alexander Hamilton, emphasizing the parallels between their lives. Both were orphans, and both were extremely intelligent, entering prestigious universities at early ages. They even had similar nicknames, Little Burr and Little Lion. Both fought the British in New York and survived the winter at Valley Forge. Their political paths diverged after the American victory over the British, and the public vilification of Burr by Hamilton over a period of years finally prompted Burr to challenge Hamilton to a duel. At this point, history becomes fuzzy, as Brown details in his author's note ("The truth is forever lost to time."). Brown tells this troubling tale succinctly, capturing the drama and ultimate tragedy of the situation. His signature ink and watercolor illustrations support the text and reflect the historical period. VERDICT There is almost nothing on this piece of history for this age group, and young history buffs will appreciate this offering. Buy where there is potential interest.—Grace Oliff, Ann Blanche Smith School, Hillsdale, NJ - Copyright 2015 Publishers Weekly, Library Journal and/or School Library Journal used with permission.